The College of Medical Laboratory Technologists of Ontario (CMLTO) exists for the protection of the public’s right to safe, high-quality health care through self-regulation of the medical laboratory technology profession. The Council is the CMLTO’s governing body and its role is to serve the public interest by overseeing the regulation of the practice of medical laboratory technologists (MLTs). The Council also establishes the CMLTO’s strategic direction and the outcomes that will lead self-regulation forward in the interest of public safety. Medical laboratory technologists (MLTs) can help shape the future by bringing their knowledge, skill and ability to Council. Council involvement provides MLTs with rewarding opportunities to contribute to both public protection and the long-term growth of the MLT profession. The election of registered MLTs to Council takes place annually on a three-year rotation through the eight electoral districts. Staggered elections ensure the CMLTO always retains a base of experienced and knowledgeable members who can assist with transitioning new members to Council. The nomination process is completed by the end of May and voting is completed by the end of September. MLTs who are registered as practising members and are in good standing with the CMLTO can be nominated and vote in these elections. All MLTs (practising and non-practising) may vote in Council elections in their respective districts. an understanding that the goal of the CMLTO is to serve and protect the public. The Council governs within a Policy Governance ® framework. Members should be aware of the CMLTO mission and vision, the Strategic Framework, its regulations and Consolidated Bylaws (PDF). Council members hold their positions for a three-year term that begins on January 1. Each professional member may serve a maximum of three terms, for a total of nine consecutive years. Council members also serve on committees to complete important projects that further the CMLTO’s strategic goals. Council meets four times a year. In addition, elected members are appointed to at least one statutory committee. The number of committee meetings per year (which may include panels, hearings, or working groups) varies according to workload. Generally, Council members should expect to spend an average of 10 to 15 days participating in CMLTO meetings each year. Council members also spend time preparing for these meetings, listening to members of the profession, and researching best practices. Council and committee meetings are usually held in Toronto at the CMLTO office at 25 Adelaide Street East, Suite 2100, Toronto, ON M5C 3A1. On occasion, Committees discuss issues via teleconference and e-mail. Council and non-Council Committee members receive a comprehensive orientation regarding the CMLTO's role, mandate, and governance framework. Council is provided with orientation and development sessions. New Council members are supported through a Council mentor program. Council members are reimbursed for all reasonable travel and accommodation expenses and receive an honorarium for their time commitment. Professional members are reimbursed by the CMLTO. Public members are reimbursed by the government. Honorarium and expense reimbursement for all Council members is in accordance with Ministry guidelines. Composed of the Cities of London, St. Thomas, Stratford and Windsor; Bruce, Elgin, Essex, Grey, Huron, Lambton, Middlesex, Oxford and Perth Counties; Municipality of Chatham-Kent; Town of St. Mary’s; and the Township of Pelee. Composed of the Cities of Brantford, Guelph and Hamilton; Brant, Dufferin, Haldimand, Norfolk andWellington Counties; and the Regional Municipalities of Halton, Niagara and Waterloo. Composed of the Cities of Barrie, Kawartha Lakes, Orillia and Peterborough; Haliburton, Northumberland, Peterborough and Simcoe Counties; and the Regional Municipalities of Durham, Peel and York. Composed of the Cities of Belleville, Brockville, Cornwall, Kingston, Ottawa, Pembroke, Prince Edward County and Quinte West; Frontenac, Hastings, Lanark, Lennox and Addington and Renfrew Counties; Towns of Gananoque, Prescott, and Smith Falls; and the United Counties of Leeds and Grenville, Prescott and Russell and Stormont, Dundas and Glengarry. Composed of the City of Greater Sudbury; the Districts of Algoma, Cochrane, Manitoulin, Nipissing, Parry Sound, Sudbury and Temiskaming; and the District Municipality of Muskoka. Composed of the Districts of Kenora, Rainy River and Thunder Bay. 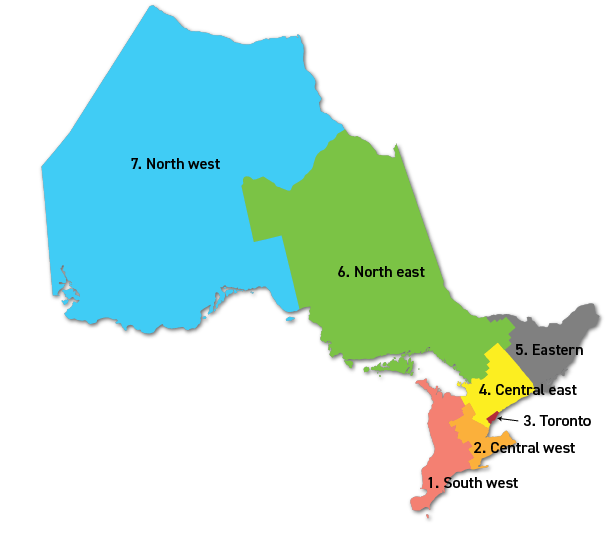 The whole Province of Ontario. “Faculty members” refers to members of faculties of an educational institution in Ontario that grants diplomas in medical laboratory sciences. Review the election section of the CMLTO Consolidated Bylaws for the complete process and to confirm eligibility to stand for election. This Call for Nominations PDF outlines the process and includes information about the vacancies this year. Review the guidelines on preparing a biography (included as an appendix in the nomination form linked below). Candidate biographies are distributed, with voting ballots, to eligible voting members in the candidate’s electoral district. Print and complete the nomination form (PDF). Each candidate must complete and submit a nomination form, and a brief biography including reasons for accepting the nomination, and a recent photograph. The nomination form must be signed by the five nominators and the candidate. Send the completed and signed nomination form, with biography and photograph, to the College’s Registrar & CEO by the published deadline (May), 120 days before the date of the election (September). Review the election section of the CMLTO Consolidated Bylaws to ensure eligibility to nominate a candidate. Nominators must reside or work within the candidate’s electoral district and be in good standing with the CMLTO. No less than thirty days prior to the election (September), every member of the CMLTO who is eligible to vote in the district where an election is being held will receive a list of candidates and biographies, a ballot (including voting procedures and the deadline for receipt of ballots), and a return addressed envelope for the completed ballot. March 2019 Call for nominations. Members are notified in FOCUS (the CMLTO member newsletter). May 24, 2019 Deadline for receipt of nomination forms at CMLTO. Aug. 23, 2019 Ballots emailed. Sept. 27, 2019 Deadline for receipt of ballots. Jan. 1, 2020 Start of term of office (3 years) for elected members. March 2020 Call for nominations. Members are notified in FOCUS (the CMLTO member newsletter). May 22, 2020 Deadline for receipt of nomination forms at CMLTO. Aug. 21, 2020 Ballots emailed. Sept. 28, 2020 Deadline for receipt of ballots. Jan. 1, 2021 Start of term of office (3 years) for elected members. March 2021 Call for nominations. Members are notified in FOCUS (the CMLTO member newsletter). May 27, 2021 Deadline for receipt of nomination forms at CMLTO. Aug. 26, 2021 Ballots emailed. Sept. 30, 2021 Deadline for receipt of ballots. Jan. 1, 2022 Start of term of office (3 years) for elected members.